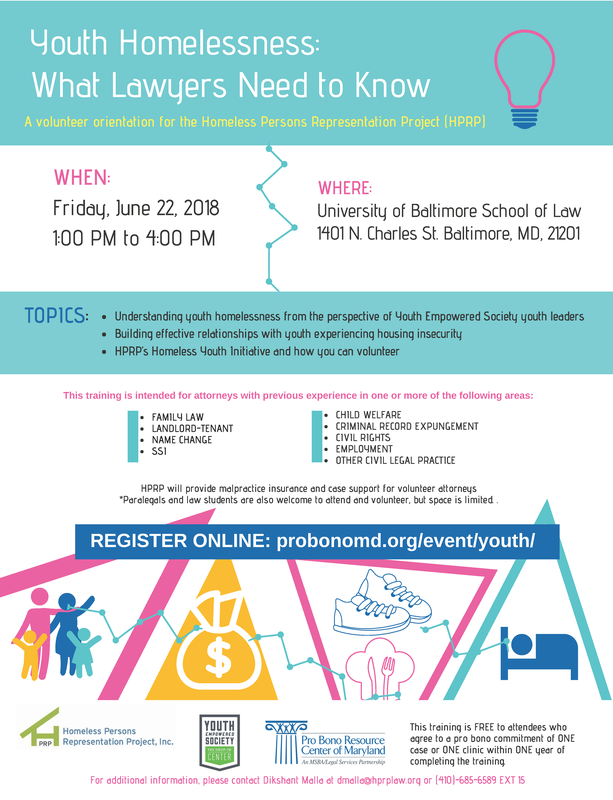 This training will provide an understanding of youth homelessness (local statistics, causes, experiences of youth), cultural competency for working with youth experiencing homelessness, and an overview of HPRP’s Homeless Youth Legal Network pro bono initiative. This training is intended for attorneys with previous experience in one of more of the following areas: family law, landlord-tenant, name change, SSI, child welfare, criminal record expungement, civil rights, employment, or other civil legal practice. Questions about HPRP’s Homeless Youth Initiative Pro Bono Project? Contact Dikshant Malla at dmalla@hprplaw.org or 410-685-6589 ext. 15. Questions about registration? Contact Kiah Pierre at kpierre@probonomd.org or 443-703-3046.